Participants of this program will be eligible for both a 100-Hour and a 200-Hour Certificate of Completion from this program by IAFNR. Participants must complete each module and pass the post-course online examination to receive recognition of hours toward the Certificate of Completion. The Certificate of Completion is independent of individual licensure credit hours. Credit hours from previous and future IAFNR annual conferences can be applied towards the Certificate of Completion. Note: Additional hours are available at other approved programs (see HERE). Participants who complete 150 hours of the FNS program plus an additional 150 hours at other approved programs (see HERE) will be eligible to sit for the fellowship examination by the International Board of Functional Neurology (IBFN). IBFN is a division of the International Association of Functional Neurology (IAFNR). 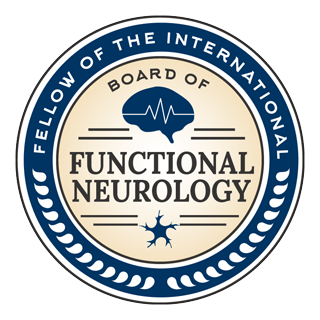 The board examination will lead to the designation of Fellow of the International Board of Functional Neurology (FIBFN). This is a multi-disciplinary board and the examination can be taken by those with an active health care license, including DC, ND, MD, DO, LAc, PT, FNP, etc. The bylaws of the American Chiropractic Neurology Board (ACNB) requires a total of 300 hours to be eligible for the diplomate examination for Doctors of Chiropractic: (Note: additional hours are available at other ACNB approved programs (see HERE). HERE is the ACNB link to CAGEN approved institutions. The Functional Neurology Seminars Program is recognized by National University of Health Sciences (NUHS) to fulfill CAGEN requirements. Listed below is the attached letter of program recognition by NUHS. National University of Health Sciences has applied for state licensure hours for Doctors of Chiropractic for all 50 major states in the United States for both onsite and online live streaming attendance. Not all states recognize live streaming education for credit hours, thus confirmation of each state’s hour approval is pending at this time.